Today I decided to take a step back and look at what’s been going right for me in post production lately. I gathered some hardware essentials, software tips, productivity hacks and more for you in this post. After reading it this make sure to tell me what is working for you right now in post production. The first thing that’s working for me is literally by my side all day, everyday. I absolutely love these external hard drives. I’ve used them for the past five years. I got introduced to Fantom Drives when my old production manager started buying their GreenDrives for deep storage of projects and shipping media to remote freelance editors when shop got too busy. My Fantom Drive G-Force3. I have six of them. Today I own six 2TB USB 3.0 G-Force3s. Three sit on my desk. One is a backup drive. One has some old projects and miscellaneous media I need from time to time. The other one is my main drive that I work off of. I take this home with me every night from the office. I’m lucky enough that all my current and recently completed projects and all my stock elements fit on a 2TB drive. Lugging the drive back and forth multiple times a week is a testament to its durability. My commute consists of a .75-mile walk and a lengthy commuter bus ride where my bag is squished up between my legs and seat in front of me. The other three drives are backups of old projects and backups of the backups (yes, a bit OCD). **FYI — I want you to know that I’ll always be honest with you. The two links to the drives above are affiliate links through Amazon. That means I’ll get a couple nickels or maybe even a quarter if you buy something off Amazon, like one of those drives, through those links. It costs the exact same for you but I might be able to buy a six-pack if a few of you were to purchase anything on Amazon through those links. 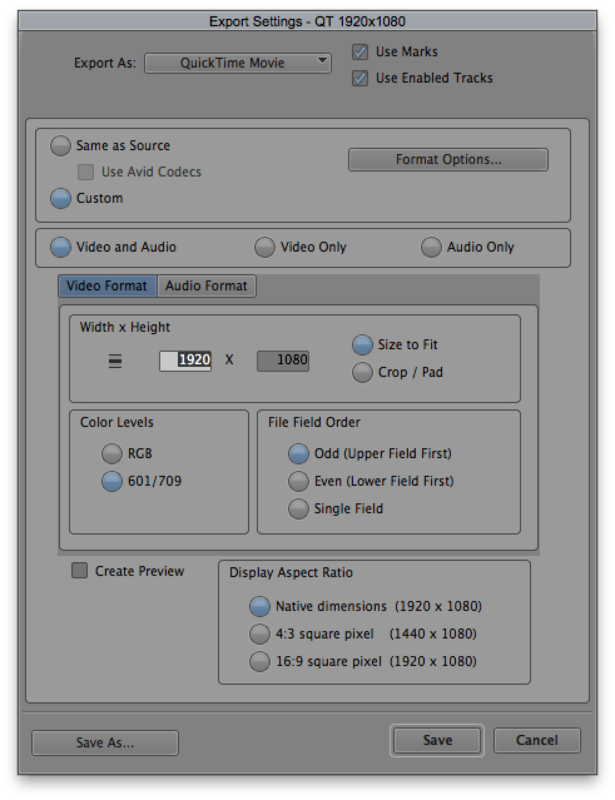 Set the folder you want to export to and Export Settings – note: do not change the name! It will export to the name of your sequence + file extension. Also, make sure Use Marks and Use Enabled Tracks are checked in the Export Settings. During my exporting breaks and virtually any of my free time I’m trying to learn Adobe InDesign. I’ve never used it before since it’s more for print and interactive documents. But I’m working on something for you and think it would be created best in InDesign (hint, hint!). I love Lynda.com. I have about 100 courses cued up in my playlist. I probably don’t watch it enough to get a return on the $25/month from it but right now, if it teaches me InDesign, it’s worth it. MITs are Most Important Tasks. Each day I list three things that if I get done I can call that day a success. I actually use two MIT lists – one for work and one for my personal goals. For work I write the three biggest things to get done that day. That could be recording audio or meeting with my assistant editor to go over projects or editing this video or color correcting that video. Have your list be three things. Any more than that and you’ll get overwhelmed. You can have a secondary list. I have one and I call it Lucky as in “I’d be lucky if I got to these.” Once I knock off my three MITs I’ll go after that list but I keep it out of sight and out of mind until I finish my three MITs. 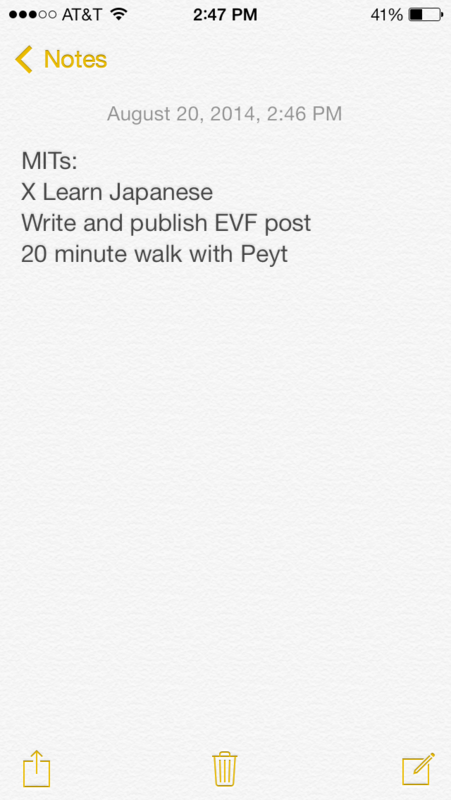 My personal goals typically consist of one mental task, one physical task and one online task. Right now my daily mental task is learning Japanese for an upcoming vacation (any advice would be greatly appreciated!). My physical task is pretty simple. Sometimes it’s go to the gym and lift or go for a run or take Peyton for a long walk. My online task is to do something for this or my other website like write a post or create a tutorial. I have never had an assistant editor until a couple months ago and it is amazing. I met her at an alumni event at my college, James Madison University. A few weeks later after graduation I got her an internship where I work. She was able to pick up Avid and AE in about two months and since then I work at 3x the speed. She has fresh, creative ideas; finds all the elements we need and strings out most of the projects. Recently she’s started finishing them too on her own. There is video work being done that I’m not involved in at all and that makes me so happy. Working alongside someone else gives me motivation and incentive to work faster too. I know many of you are or want to be assistant editors or don’t have one so you can’t relate to my position but having a really good one makes a huge difference to your work output. We will talk more about what makes a great assistant editor another day. In this post I went over with you what’s working for me right now in post production. 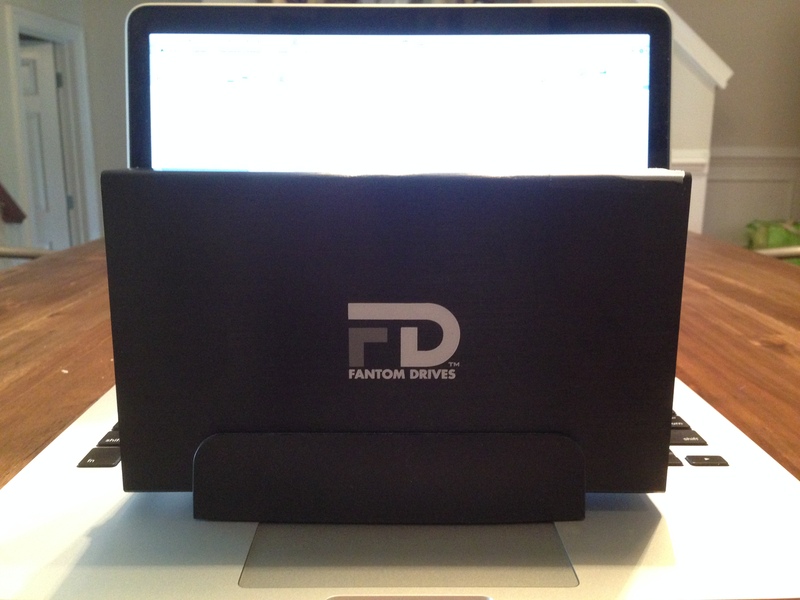 I cannot live without my Fantom Drives. Batch exporting in Avid is giving me time to write this post. Lynda.com is teaching me Adobe InDesign. I write out and complete my three MITs each day. And having an assistant editor has tripled my work output. What’s working for you in post production right now? I want to know. Share your thoughts below! Lastly, I’m going to start trying to publish a new tutorial each Friday. Let me know if there’s anything you want me cover and I’ll try to make it for you. Thanks as always for reading and I can’t wait to see what’s working for you in post right now!